Full Service Yarn Shop: Spinning Group, UFO and NH Sheep & Wool! NOTE: The shop will be closed tomorrow (Saturday, 5/13) because I will be at the New Hampshire Sheep and Wool Festival. Hope you can make it too! Spinning group was nice last night. I wasn’t sure how many people would show up since I knew at least two of the regulars were unable to come but we had a nice bunch! Monica was in town for the day and brought her wheel along. She’s going to be whupping the Boston Area Spinners and Dyers Guild website into shape. I tried to keep it updated a few years ago but, unfortunately, grossly overestimated my ability to learn HTML as well as the free time I had to commit to the project. It is good to know that things are now in the hands of a professional! I’ll put up a link as soon as she’s got the site revised. 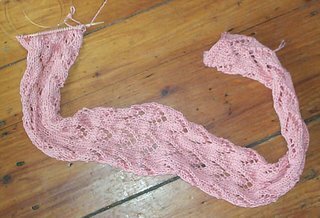 Today’s UFO is the scarf that you may have read about in the newsletter. This is another project that is really close to being finished. 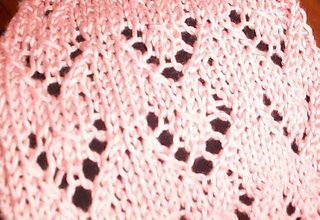 Here's a close-up of the lace pattern. It will looke better when its blocked. This is the third project in a row that I have talked about as “almost finished”. I should really just start picking one and finishing it before going to the next! Ah, if only I would. Well, the full moon is coming and waning moons are for finishing projects the way new moons are for starting new ones. Hopefully, I’ll be able to get a lot of knitting done tomorrow on the way to and from the New Hampshire Sheep & Wool Festival. My main goal at the festival is to buy fleece! Lots and lots of fleece! White fleeces, gray fleeces, black fleeces! I love fleece, yes, I do. I love fleece, how ‘bout you? …. Okay, I’m back. I won’t be bringing the fleece back to the shop, though. I’m going to drop it off at the Zeilinger booth and have them wash and card it for me. It should be back here in a month or so in the form of roving. Before we leave, I’ll be recording the next installment of Guido’s “It’s a Purl, Man” Yarn Crawl podcast. Be sure to listen in! Now I'm off to fold and stamp snail mail newsletters for the people that are still receiving their newsletters that way. If you are one of those people and would like to change to email, just send an email to me at lucy@mindseyeyarns.com and I'll switch you over! and i'm SO jealous of the fleece shopping! i love the wool stuff. bleat at a sheep or two for me? Welcome to the blogosphere! I'm looking forward to keeping up with your "full service yarn shop" goings-on! Melissa, I'll change your email over. Also, I'll be sure to give all the sheep your love! Danielle, Thank you! I hope to make this blog worth your while! awesome idea about plying, not only because i already have a bunch of single ply ufos (are they ufos in spinning too? i guess they aren't objects when they're done, they're skeins). Do i remember right that the idea with angora is that you wash the finished skein but don't abuse it? ugh- i'm so bad at, you know, remembering stuff.